You may use it to check out past versions of a page on the Internet, or access pages that are permanently or temporarily not available. It is also a great option to recover web pages as a webmaster that are not accessible anymore (maybe because your hosting company terminated the account, or because of data corruption and lack of backups). Several browser extensions, Wayback Fox for Firefox or Wayback Machine for Chrome and Firefox make use of the Wayback Machine’s archive to provide users with copies of pages that are not accessible. While you can download any page on the Wayback Machine website using your web browser’s “Save Page” functionality, doing so for an entire website may not be feasible depending on its size. Not a problem if a site has just a few pages, but if it has thousands of them, you’d spend entire weeks downloading those pages manually. Enter Website Downloader: the free service lets you download a website’s entire archive to the local system. 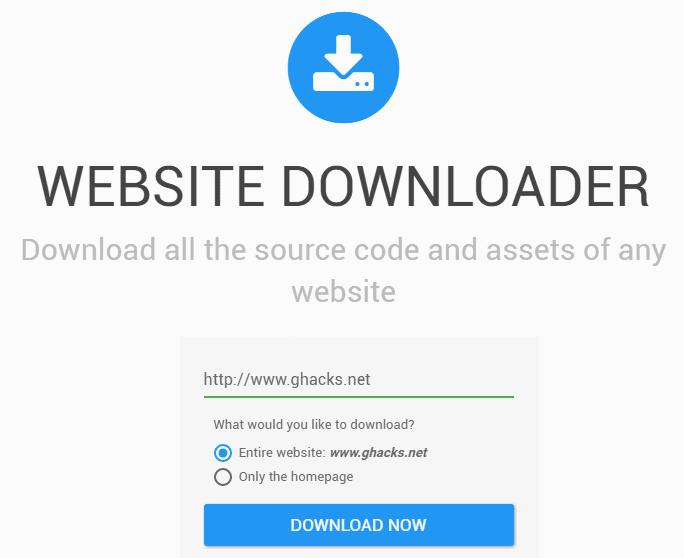 All you have to do is type the URL that you want to download on the Website Downloader site, and select whether you want to download the homepage only, or the entire website. Note: It may take minutes or longer for the site to be processed by Website Downloader. You may download the copy of the site as a zip file to your local system after the background process completes, or use the service to get a quote and get the copy converted to a WordPress site. Website Downloader is an interesting service. It was swarmed with requests at the time of the review, and you may also experience that the generation of website downloads, even of single pages, takes longer than it should because of that. There is also the chance that some people will abuse the service by downloading entire websites, and publishing them again on the Internet. This entry was posted on Wednesday, April 5th, 2017 at 10:31 am	and is filed under General News. You can follow any responses to this entry through the RSS 2.0 feed. Both comments and pings are currently closed.